The Twelve Recipes of Christmas series continues and this delightful pudding would look great at a New Year’s Eve celebration as well as welcoming guests on Christmas Day and throughout the festive season. Dawn: Enough of the alliteration Andrew! Dawn: And what do we have here?!? Andrew: Pavlova! This is a meringue-based dessert named after the Russian ballerina Anna Pavlova. Like a meringue cake with a crisp crust and silky interior usually topped with fruit and whipped cream. Dawn: Oh joy, oh joy! Perfect for the Christmas table! However, it requires a great deal of patience. Draw a guide circle on a sheet of baking parchment (paper) using a plate as a template. Turn the paper over, and set to one side. Whisk the egg whites in a large, clean bowl with a hand or electric whisk until they are stiff but not dry. Andrew: This can be tested by holding the bowl over the head of a friend. Dawn: I’ll just retreat to the other end of the kitchen while you do that! Whisk in the sugar, a spoonful at a time, for a few seconds between each spoonful. The slow addition builds up volume in the meringue and make it stiff yet silky and shiny. Finally, whisk in the vanilla essence and cornflour until well combined. Position the baking parchment, drawn side down, on the baking sheet, held in place by a dab of meringue mix in each corner. Spoon the meringue into the still-visible circle. Shape with a rubber spatula to create a large meringue nest, with soft peaks rising on all sides and a well so that the whole construction resembles a very large “nest”. Place in the centre of the oven and bake for 1 hour until very lightly coloured and crisp on the outside. (If the meringue seems to be becoming too brown, reduce the temperature of the oven). After 1 hour, turn the oven off and leave the meringue for a further hour. Dawn: We did this one evening and returned to it the next day to complete the dish. Carefully remove the meringue from the baking parchment, using a spatula if necessary, and place onto a large serving plate. Whip the cream into soft peaks and spoon into the centre of the meringue. Top with the fruit of your choice. Decorate and dust with sifted icing sugar to serve. 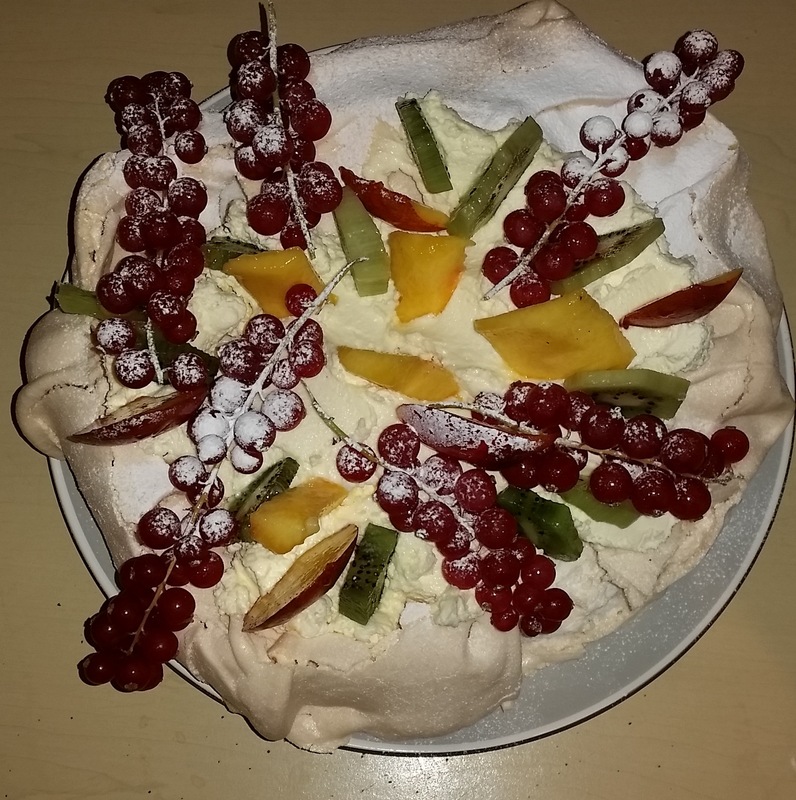 Andrew: We used redcurrants, nectarines and kiwi for a bejewelled effect. Dawn: Anything to hand or in season will be fine. Passion fruit, pomegranates, summer fruits…the list is endless and we suggest you use what fruits you have in or seasonal produce. Andrew: Peaches, apricots: there is no limit to your imagination. Dawn: A delight to behold and looks very pretty! It’s very reminiscent of a Christmas “Welcome” door wreath! Simply gorgeous and oh, so more-ish to eat! 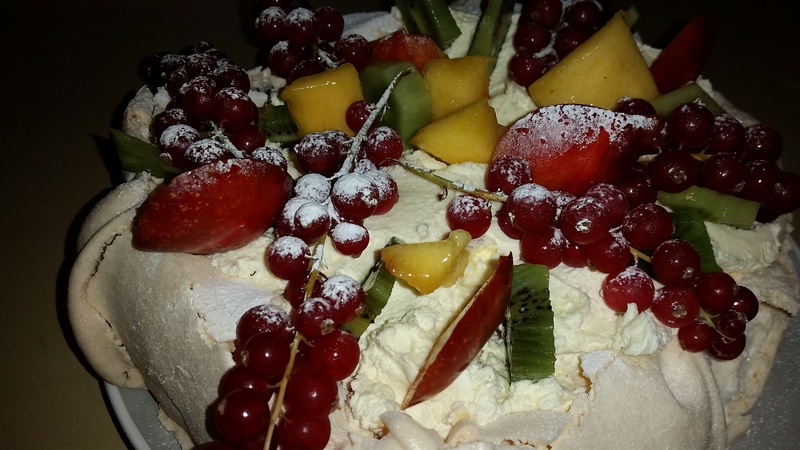 Posted on December 29, 2015 by Love Food UK	• This entry was posted in Cakes, Christmas, Home Baking, Just Desserts, Special Days and tagged easy to follow pavlova recipe, how to make pavlova, just desserts pavlova recipe, pavlova recipe. Bookmark the permalink.